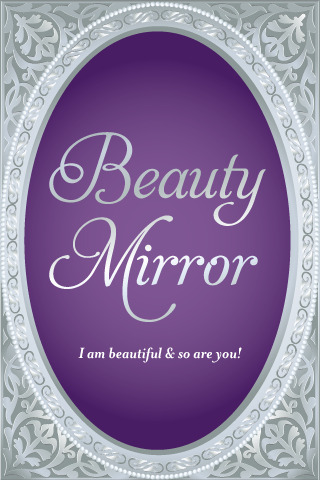 Beauty Mirror, a new iPhone application, helps young girls increase their self esteem and confidence. The interactive interface allows each girl to add her own photos and affirmations about how smart, pretty, kind, funny, talented, and beautiful she is. Beauty Mirror redefines beauty to encompass a range of attributes, including smarts, kindness, activities, giggles, and heritage. Building self confidence is a critical activity for girls because their self image drastically changes as they approach their teens. A recent study by Dove found that 75 percent of girls aged 8 and 9 liked their looks, but that figure dropped to 56 percent among girls aged 12 and 13. The same study found that seven in ten teenage girls (71 percent) believe they are not good enough. In surveying adult women, the study found that only 2 percent of women describe themselves as “beautiful”. In Beauty Mirror, girls create Beauty Slides by taking photos of things they are proud of and combining them with their own positive message. 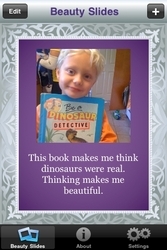 Girls can also acknowledge the beauty in others by making and emailing positive mirror messages to their friends. Parents can support their daughters' self esteem by creating Beauty Slides together. “Teaching girls to take pride in themselves is critical today and this application does it in a playful way that young people and parents will really enjoy,” said Dr. Minette Riordan, certified coach for parents and Publisher of “North Texas Kids” magazine. “This is a great app! Dads have such an opportunity to influence a daughter’s self-confidence and esteem and this is a great way to do it. It’s fun too!” commented Jason, a father with three daughters. Beauty Mirror comes in two versions. In the free, lite version, users can make up to five Beauty Slides. In the paid version, $1.99, users can make up to 20 slides and can e-mail them. The applications are exclusively available at the iPhone app store. Beauty Mirror iPhone App for GirlsThis is the loading screen for Beauty Mirror. The Beauty Mirror IconBeauty Mirror iPhone app icon A "Giggles" Beauty Slide.This is a "Giggles" beauty slide from one of our fans.